Mexico was well represented by the Sayulita crew, with Javier “Bicho” Jiménez winning Silver in Racing Distance and Felipe “Bodoque” Hernández getting Bronze in SUP Surfing; the Team USA won the World Championship and broke Team Australia’s winning streak—they’re now in second place. 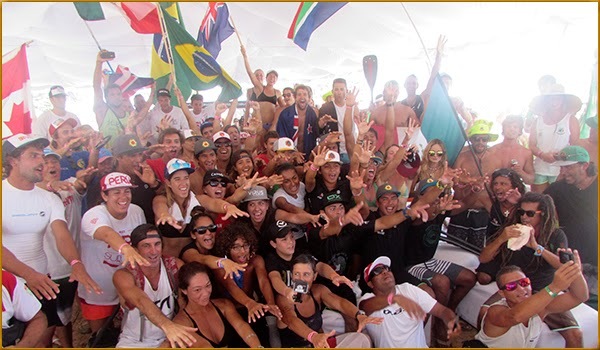 The 4th ISA World SUP & Paddleboard Championship in Sayulita has ended. Mexico reaffirmed its place among the best in the world by taking 6th place by team, while Sayulita hosted the event in high style. Though the desire to be on the winner’s podium is strong, the fact is the Mexican team is very young, which in turn means they have an incredible potential of taking a spot on that stand once again in upcoming events. Half of the team have placed in the top 5 worldwide, but the other half is just beginning to compete on a professional level. The team champions in this event were from the United States. The Team USA upset three-time winner Australia, who was gunning for a fourth consecutive win. Click here for the results: http://isawsuppc.com/es/. “This is a great experience for these young athletes and we know we can strive for more; we just needed a little more experience as a team and to get tighter with every event. The people of Mexico came together to support our team and I think this energy will help us win medals in the upcoming years,” said Ryan Helm, trainer for Team Mexico. “I’m very happy with the results and we’re going to keep training until we’re in first place. We’re happy to have hosted this event in our own backyard and we’re moving forward. I hope all of us continue training, we needed a little more to complete the team but we’re strong,” said Silver medalist Javier “Bicho” Jiménez. “I’m very happy to be representing Mexico, it’s an honor to represent your country. We upheld its good name and proved that Mexico is growing and has a strong team that learned a lot during this event and won a lot as well,” added Bronze medalist Felipe “Bodoque” Hernández. “I’m very pleased to have been a part of this, to be one of the first to risk diving headfirst into this sport, to focus, to travel… Together we have several very strong guys, and as a team we have gotten enough results to bring the world championship here and this will be the springboard that launches this sport in Mexico,” added Fernando Stalla, team captain and Mexico’s SUP pioneer.